Updated 10:01AM, Tuesday December 4th, 2012	by Sam Hailes, Christian.co.uk Be the first to comment! “I don’t tell jokes in interviews.”If I were talking to a politician, musician or author I’d understand such a statement. But coming from a comedian – and a talented one at that, Andy Kind’s comment takes some explaining. It was just after his languages degree that the northerner decided to undertake a drastic career change. Leaving behind his extensive knowledge of French, Andy started looking for comedy gigs. He got one. 300 away miles from his hometown of Newcastle, Andy did a 10 minute unpaid set in Bath. Eight years on, much has changed. Andy is now a full time comic. He’s also got a wife, baby and less excitingly, a mortgage. Andy says he felt “amazing” the first time he got paid for a comedy gig. It may have only been £10 but considering Andy was still living at home, the early days didn’t require a huge income. 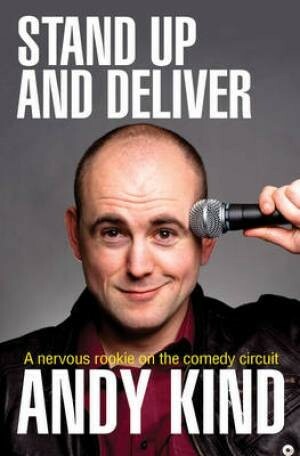 Andy’s first book Stand Up and Deliver details his rise from amateur to professional. He says he was in the right place at the right time and feels “blessed” to have had such a stress-free publication process. The journey to becoming a full time comic was an amusing one. The book contains plenty of stories to make you laugh, and at times cry. Andy sounds almost proud of how he once had a bottle of urine thrown at him by a heckler in Glasgow. “I squelched off stage”, he recalls, adding “feel free to mention that”. Thanks to the book's popularity and rave reviews a sequel, 'The Gig Delusion' is already on its way. Despite 'Stand Up and Deliver' being produced by the Christian market, Andy says it’s not for the Christian market. He used to describe himself as a clean comic but no longer sees the need. “I called myself a clean comedian and I got some work off the back of it. But I was getting booked because I was clean, not because I was properly funny and now I am properly funny I don’t need to play on the clean thing,” he explains. Andy spends more time talking about what comedy is (and isn’t) than his own act. He has many thoughts on the art form – viewing it as unique because of its demand for attention. Andy has strong views on both his faith and his profession. Do they go together? Yes and no. Andy says he’s “blessed”. He’s a full time comedian with a top book and loving family. What does the future hold? Despite continually working his way up to bigger and better gigs, Andy is uncertain about his future in stand up.